Read the Patient Information Leaflet if available from your pharmacist before you start using lifitegrast and each time you get a refill. If you have any questions, ask your doctor or pharmacist. Use this medication in the affected eye(s) as directed by your doctor, usually twice daily (once every 12 hours). To apply eye drops, wash hands first. To avoid contamination, do not touch the tip of the single-use container or let it touch your eye or any other surface. Do not open the single-use container until you are ready to use it. After use, throw away the remaining contents of the container right away. If you are wearing contact lenses, remove them before using eye drops. Wait at least 15 minutes before replacing your contact lenses. Tilt your head back, look upward, and pull down the lower eyelid to make a pouch. Hold the dropper directly over your eye and place one drop into the pouch. Look downward, gently close your eyes, and place one finger at the corner of your eye (near the nose). Apply gentle pressure for 1 to 2 minutes before opening your eyes. This will prevent the medication from draining out. Try not to blink or rub your eye. Repeat these steps if your dose is for more than one drop. If directed to use this medication in both eyes, repeat these steps for your other eye. Use eye drops before eye ointments to allow the drops to enter the eye. Wait several minutes for your vision to clear before driving or operating machinery. What conditions does Xiidra Dropperette, Single Use Dropper treat? Eye discomfort, temporary blurred vision, or an unusual taste sensation may occur. If any of these effects last or get worse, tell your doctor or pharmacist promptly. List Xiidra Dropperette, Single Use Dropper side effects by likelihood and severity. Before using lifitegrast, tell your doctor or pharmacist if you are allergic to it; or if you have any other allergies. This product may contain inactive ingredients, which can cause allergic reactions or other problems. Talk to your pharmacist for more details. What should I know regarding pregnancy, nursing and administering Xiidra Dropperette, Single Use Dropper to children or the elderly? Store at room temperature away from light and moisture. Keep the medication in the original foil pouch until ready to use. Do not store in the bathroom. Keep all medications away from children and pets. 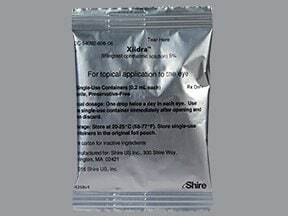 Are you taking Xiidra Dropperette, Single Use Dropper? 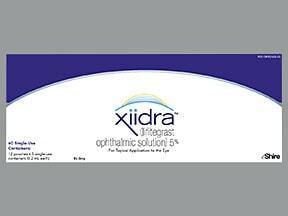 Are you considering switching to Xiidra Dropperette, Single Use Dropper? How long have you been taking Xiidra Dropperette, Single Use Dropper?